The Massachusetts State Senate announced the “Commonwealth Conversations 2017 Tour,” bringing Beacon Hill back to Main Street for a second session. The Commonwealth Conversations Tour is a statewide listening tour of each State Senators district to visit with local residents, businesses, and interest groups to listen directly to their needs and concerns. 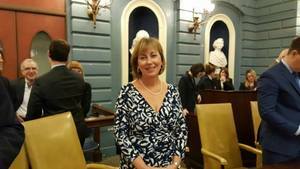 The Northeast leg, hosted by Senators Barbara L’Italien (D-Andover), Eileen Donoghue (D-Lowell), Bruce Tarr (R-Gloucester), and Kathleen O’Connor Ives (D-Newburyport), happens on Tuesday, March 21, from 6:30 to 8 p.m. The event will take place at Maloney Hall, 220 Pawtucket Blvd. on the Campus of UMass at Lowell. The goal of the tour is to foster more civic engagement while helping each Senator learn more about issues outside of their own districts. Each member of the Senate has committed to attending at least two of these sessions outside of their own region that is not an adjoining district to their own. Each day will end in a town hall open to the public for the specific region. One of the four stops in each region will be a public transportation-focused session led by the Barr Foundation. These sessions, known as MassMoves, are designed specifically around transportation issues in each region in effort to build a vision for sustainable mobility across the entire Commonwealth. The Northeast portion will feature stops at the Parker River National Wildlife Refuge Headquarters in Newburyport, a MassMoves transportation forum in Ipswich, an economic development roundtable at Lawrence General Hospital, and a town hall forum at UMass Lowell for constituents to engage with their State Senators. Members of the public are welcome and encouraged to join the town hall forum at UMass Lowell. In 2015, the Senate spent 8 days visiting different regions of the Commonwealth and heard from thousands of citizens who expressed their concerns on issues ranging from climate change, to education and income inequality. To follow along with the tour, visit the Commonwealth Conversations website https://malegislature.gov/cc. Members of the public are encouraged to join the March 21th Lowell Town Hall Forum portion of the tour at University Crossing, 220 Pawtucket Street, Moloney Hall, 2nd Floor.